There is a saying: at twenty-five you have the face that you inherit, but at fifty you have the face that you deserve. I cannot tell you whether that is precisely true, but it does seem to contain some wisdom. From midlife onward your life – and your face – both become the sum of your choices. That’s why 25-year high school reunions are so interesting – and so galling. You find out whether those kids you knew then continued on the same trajectory or not, and you learn whether that direction was profitable or not. Some are predictable, and some are a complete surprise. Jacob is at that point in his life – somewhere in midlife, learning what the aggregate of his life-choices might mean. He has left the service of Laban, having outgrown his position as a servant-shepherd, ready to take on a new role. He is smart and capable, able to serve as the leader of his own clan – so why, he wonders, is he still working for a servant’s wages? No, the time has come for him to take his leave, along with his entourage, which has in fact become a rather large caravan. But that departure from Laban’s household also means that it is time to return home to face his demons there. And he is worried: going home requires that he face his twin brother, the very same one who vowed to kill him all those years ago. His brother never was one to let bygones be bygones, so this homecoming could be a genuine problem. Jacob is afraid. Worried about the outcome, Jacob sends messengers ahead of his caravan to send greetings to his brother Esau. But they return to him with the message that his brother is coming out to meet him in person. And, the messengers explain, Esau has 400 men with him. O God of my father Abraham and God of my father Isaac, O Lord, who said to me, ‘Return to your native land and I will deal bountifully with you’! I am unworthy of all the kindness that You have so steadfastly shown Your servant: with my staff alone I crossed this Jordan, and now I have become two camps. Deliver me, I pray, from the hand of my brother, from the hand of Esau; else, I fear, he may come and strike me down, mothers and children alike. Jacob is afraid, genuinely afraid. But his prayer is not just an expression of fear; it is also a realization. As the modern commentator Nehama Leibowitz notes, his prayer also reflects a sudden insight, an insight gained in the midst of his prayer. Jacob suddenly realizes the emotional cost of what he had done all those years ago. At the time of his deceit, he had not really understood how his behavior would hurt his brother; now, as a grown man, having been tricked himself, he has insight. Pausing to reflect on these experiences, he finally understands the shame and humiliation that his brother felt. As Leibowitz continues, “Perhaps he still justified the immoral deed by the justness of the end, given the seal of approval in his father’s confirmation of the blessing after the deed: ‘yea, and he shall be blessed.’ He had still not experienced even the shadow of a doubt regarding the rightness of his conduct. Only now through his prayer he experienced a re-appraisal of his conduct.” And he realizes that he has been unworthy of all of the blessings he has received. And, it suddenly dawns on him just what it must have meant to his brother to have been tricked like that. And he suddenly understands what he, himself, has done. And now, as a result, he has become a fully ethical being. Hermann Cohen, the neo-Kantian Jewish philosopher from the turn of the last century, argues that genuine morality is born when we understand how the other person feels. Up until that moment, we are not truly making ethical choices: we have no sense of why a given action – such as tricking your brother – might be wrong or unethical. It is when we realize he hurts just like I do that we are able to make moral choices. In fact, all of ethics can be summed up as follows: I should not hurt him because he hurts just like I do. But Jacob is like that: sometimes he is ethical, sometimes not; sometimes he is responsible, sometimes not. Sometimes he is able to transcend himself, to gain genuine insight and recognize his part in the drama and act ethically – and sometimes not. This division within him is evident in one of the most famous passages in the narrative of his life. After sending his clan across the Jordan River, he sleeps alone on the other bank. Why is he alone? It does not say. Maybe he thinks that if Esau attacks both of the camps at night, he is more likely to survive if he is out on his own. It does not occur to him that his family might want the reassurance of his presence in the camp. While Jacob is alone, he is attacked. Who is this man who attacks? Why does he attack? What does he want? When he [the attacker] saw that he had not prevailed against him, he wrenched Jacob’s hip at its socket, so that the socket of his hip was strained as he wrestled with him. Why exactly does this attacker tear the ligaments in Jacob’s hip? It seems like something more than bad sportsmanship. Either that, or angels are sore losers. This is our first hint that this being might not be a man after all. Why is it that this being won’t give his name? And who is it? One possibility, proposed by the rabbinic literature, is that this man is an angel, the prince of Esau. In other words, this angel is what we might call the guardian angel of the people of Esau, and it was Esau’s and Jacob’s angels engaged in battle. A cosmic battle takes place before the two brothers meet; its significance is to foreshadow that Jacob’s people will eventually win, but at great cost. As Ramban explains: “There were other generations who did such things to us and worse than this. But we endured all and it passed us by…” Ramban and the Midrashic literature would like to have us think that God sees to it that Israel always wins. But there are problems here with this reading. For one thing, God doesn’t ever give him that promise. And frankly, I don’t think that we should bet on that. Another possibility – proposed to me by one of my Bible professors some years ago – is that the attacker is actually Esau himself, come to do battle with Jacob. That’s why, when they reunite, Jacob exclaims, “to see your face is like seeing the face of God.” He had thought he was wrestling with an angel, only to discover that angel was really Esau. His brother did indeed try to kill him, just as he had vowed to do, but when he realized that he could not do so he gave him a blessing instead. There is a certain logic to this reading, in the sense that it allows Esau to fulfill his vow to attempt to kill him, and it resolves the tension of Jacob’s stolen blessing: now Jacob receives the blessing directly from his brother, and the blessing is no longer considered a theft. It is an excellent suggestion. But in recent months, I have been less enamored of this kind of reading. I find, of course, that each time that I encounter the text, it has something different to say. This year I am finding a lot of meaning in the tension itself; I have felt a greater appreciation for the Bible’s willingness to leave some things unresolved, am I am a little less willing to collapse the text into a neat resolution. The narrative does wind on itself, like some sort of DNA helix: certain things get repeated, or handed down, sometimes in precisely the same way; yet in each new version there is also something novel and unexpected. This episode is one of those repetitions. Jacob yet again, in the hours of darkness, is faced with a deception: In this case, he is wrestling someone who will not tell him his name or his reasons for being there. But this time, when asked, Jacob gives his own name, and gives it honestly: Jacob, the supplanter. The one who will trick you in order to take your place. And the angel tells him, “Your name shall no longer be Jacob, but Israel, for you have striven with beings divine and human, and have prevailed.” Israel literally means he-who-struggles-with-God. The root of the verb is ‘to struggle or contend with’ – but interestingly, etymologically the root is also related to the root for ‘dominate’ or ‘reign’. So there is a very real sense of struggle here: which will be dominant, the desires of this unruly man, or the will of God? And so the episode with the angel tells him: No longer are you the one who supplants your brother. No longer are you the one who engages in tricks. You are now the one who struggles with God, with ethics, with all that is high and holy in deciding what to do. Of course, you are also always still Jacob, the one who seeks the shortcut or the quick win. Yet you are also capable of becoming someone much grander, much greater than that: You are Israel, the one who struggles to transcend himself. And that lesson has resonance: We all struggle with our lesser nature. We all have to make an effort to choose well, to transcend ourselves. And in that sense, we too are Israel. Nehama Leibowitz, Studies in Bereshit/Genesis, translated by Aryeh Newman, p. 364. As quoted in Leibowitz, pp. 369-70. According to the Etymological Dictionary of the Hebrew Language by Ernest Klein (Jerusalem: Carta, on behalf of the University of Haifa, 1987): sin-resh-hey is ‘to fight, strive, contend’ (p. 681) and sin-resh-resh is ‘to rule, reign, dominate’ (p. 684). See also the entry for ‘Israel’ on p. 266. The story has neither hero nor villain, just people behaving badly. You are the one who picks the hero, the one with whom you identify, and you are the one who chooses the villain. It is a rather odd prayer: He is asking to be lucky. Either God is in charge of all of these small details, arranges things to happen the way they do, and therefore it is no coincidence, in which case it makes no sense to pray for good luck – or – God is not in charge of these details, and does not make such things happen, in which case it makes no sense to pray for good luck. In other words, there is luck – God is not a micromanager – but ultimately it was God who created the situation in the first place. Option 1 is that the game is rigged, and you are asking the casino owner to load the dice in your favor. Except then it is no longer a game of chance. This is what’s called a deterministic universe, in that the outcome is determined in advance. The notion of divine Providence requires at least some amount of determinism in order to work. Option 2 is that the game is not rigged, and the casino owner is not able to intervene. You get what you get. In that case, it’s not particularly useful to ask the owner to load the dice for you. This is what we mean when we speak of free will: you pay your money and take your chances. And you get what you get. Free will requires that the outcome is not determined in advance. In order for it to be a real choice, either outcome must be possible. And therefore not already determined. Option 3 is that the game is not usually rigged, but under special circumstances it’s possible to load the dice, if you should ask the casino owner nicely. This is what we mean when we use the phrase “Special Providence.” Most of the time the rules are in place, but God can intervene as needed. I use the imagery of a casino for a reason: Most of us would prefer that we had the power to rig the game. Or rather, that we had the power to convince the casino owner to rig the game in our favor. Yet, at the heart of it, the rigged game is not just or fair, is it? Can justice flourish if the game is rigged so that the good always win? And would you want to participate in a system where what is good is defined exclusively by what the casino owner likes? Let us hope that it is a benevolent casino owner. Most of us would prefer that there was some benchmark, some absolute by which goodness could be measured, rather than having to bend to the caprice of another. Okay, so let’s agree that God is infinitely good, unlike our hypothetical casino owner, and God is also just, and fair – and let’s say that the notion of God’s goodness is used as the benchmark. Would it work to have the game that is rigged in favor of those who were good, as God is good in an absolute sense? But now you have another problem: are the ones who are being good really actually being good – or are they merely being prudent? For example, imagine a cashier at that casino with a cashbox that will be audited at the end of the shift. If the cashier gives you correct change and does not cheat you, is the cashier doing what is right because it is indeed right, or is the cashier merely doing what is necessary to keep out of trouble? If you know that the cashbox will be audited, and that there are indeed consequences when it is not kept accurate, then it is simply foolish to give incorrect change, except by unconscious mistake. Interestingly, my friend the Christian fundamentalist believes that people will only do what is right if they know that their behavior is being judged. The cashier with the cashbox, in his opinion, gives correct change only if it is well-known and well-established hat the cashbox will be audited. I tend to disagree with him about that, but I am also an optimist by nature. But let’s return to our example: For the game to be fair, it can’t be rigged – right? You pay your money, you take your chances, and you get what you get. So let’s look again at the servant and his prayer: why would he be asking the casino owner to bring him luck, if the game is not rigged? As if the casino owner could help! And if the casino owner can help, then why ask for luck? You ask instead for a good outcome. The casino owner has no power over ‘luck’. Luck is not helpful here. This paradox is precisely why some commentators (including me) prefer to read the servant’s statement as a test rather than a prayer: He is calling out to God to be a witness, not a guarantor. The servant’s camel request is actually somewhat annoying and difficult to accomplish. The young woman is to bring water for him and for all ten of his camels as well. That’s a lot of water – a lot more than what can be carried on her shoulder. The laws of hospitality require that she give a drink to a stranger – so the first part of his test is one of basic civility – but as for watering his camels, well, he’s on his own. So he’s seeking out a woman who will go out of her way help more than is required of her – and who is strong enough to do it. He has, after all, ten camels with him, and every one of them can drink several troughs full. To give some Biblical background: In the Biblical stories, the extent of a person’s hospitality is considered a reliable indicator of a person’s character. For example, the people of Sodom and Gemorrah are considered wicked because they wish to inflict harm on strangers in their city. Abraham is considered righteous because he immediately extends hospitality to the three strangers that appear at his encampment – he runs to serve them. And the refrain ‘be good to the stranger, for you were strangers in Egypt’ appears repeatedly in the Exodus narratives. So the servant is looking for a righteous woman, and a strong one, and (interestingly enough) one who will talk to strangers. And he indeed finds her in the person of Rebecca. Though the Bible does not say that his request (or prayer, or test) was fulfilled by God, the narrative gives us that sense: no sooner than he had finished speaking did she appear. And not only does she fulfill the requirements by offering to give him water and to water his camels as well, but it says repeatedly that she hurried to do so. And she does so with such graciousness and charm that she must have seemed heaven-sent. Still, we need to be careful here. If we accept that this woman is sent out by God in fulfillment of the servant’s prayer, then we also have to accept those times when she does not appear, when the prayer does not work, when things don’t work out right. This date is also the date of Kristallnacht, the start of the Nazis’ reign of terror against the Jews in Nazi Germany. Do we blame God for that one too? Let’s then go back to our casino example: if the game is fair, then it is not rigged. We don’t automatically win. That only happens when we are small children and our parents indulge us. Good does not always win – but it should. It is a moral imperative that we make that happen, that we engage with the universe and see to it that it is fair and just. The game is not rigged – but somehow the outcome matters, and it matters greatly. Which is, of course, where the casino metaphor breaks down. Because, of course, we are not merely throwing dice. The outcome matters greatly. So let’s look for a moment at a different kind of prayer, at the Misheberach, the prayer for healing. The phrase ‘misheberach’ means ‘the One who blesses’ – may the One who blesses, who blessed our fathers, Abraham, Isaac, and Jacob, and our mothers, Sarah, Rebecca Rachel and Leah, heal this person. Is this prayer some kind of foolishness? Certainly not. But are we not asking for something that cannot happen? Are we not asking for God to intervene to create a favorable outcome. Not exactly. When we try to get God to do our will, that is called theurgy. Theurgy is a fancy word for magic. We are trying to cast a spell that will cause the Godhead to do our bidding. The Misheberach prayer is not theurgy; it is not magic. Rather, it is a statement of outcomes. It is the expression of a wish to be whole again, to be healed, the acknowledgement of our fear in the face of disease, our desire to hold on to what we love, our interest in rising above our mere flesh to have a life of meaning. It is a request that all of the spiritual energy that is available to us – and it is considerable – be focused on the goal of healing, this one person, right now. The servant was not praying for luck: he was praying for the ability to discern the results of his test. And we are not praying for luck: we are praying for the ability to respond in the best possible way to the challenges we face. And that is a very real prayer, and a very powerful one. Leibowitz, New Studies in Bereshit. I removed the word ‘Himself’ in order to make the phrase gender-neutral. Events like the recent hurricane provide dramatic examples of how life can fundamentally change and of how it can do so quite suddenly. Half of the people on my Facebook feed are posting pictures of kids in Halloween costumes, political arguments, and sports commentary; the other half are posting pictures of downed trees, flooded streets, and ruined interiors. It is heartbreaking to watch. And we have the problem of why: Why was New York City affected? Why was New Jersey hit so hard? And why were we spared? It does not take long, of course, for the bad theology to show up: a firebrand preacher suggests that the new law regarding the freedom to marry in New York must be the reason for the hurricane, and an orthodox rabbi chimes in to agree: yes, this is an example of God’s wrath. Such arguments, of course, are genuinely misguided. To begin, I think that they have the wrong idea about same-gender love relationships. I think that New York was exactly right to enact that law. But even if they had given a reason other than the marriage law, this kind of theology fails on the basis of its own logic: for example, it does not fundamentally explain why God would want to unleash such destruction over such a large area, most of which was outside of the presumed-to-be-offending state. No, when you start thinking in those terms things quickly become grotesque. And it is for this reason that most thinking folks recoil from the suggestion that God would send a hurricane that created extensive damage in eight plus states in order to punish the majority of voters of just one of them. But alternate versions of this bad theology are also proposed from time to time. They seem less problematic because they appear to work on a smaller scale: God sent X in order to… test us, or mold us, or punish us, or teach us. Or something. The appeal of this kind of theology, of course, is that it provides us with an illusion of control. Even if it means that we must accept bad outcomes, such as the devastation of innocents, this theology is enticing because it gives us the power over these events. If our sin caused it, then it must mean that we could stop sinning and thereby cause it to stop. Or, if this event was to teach us, then perhaps we could cause it to stop by absorbing the lesson. Or something. As it happens, this is the week in which we read the puzzling narrative of the binding of Isaac, and we are left with many of the same kinds of questions. Why does God test us? What causes God to choose Abraham, for example, and what causes God to choose Isaac? Why is Isaac bound, yet then spared? We could, of course, retreat from these questions and answer that these are simply aspects of God’s mystery. But that’s not such a satisfying response, really; that’s just dodging the question. So, then, what else can be said? 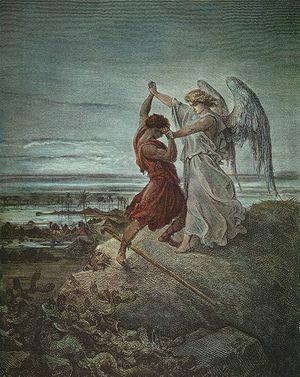 One of the Talmudic responses to the question ‘why was Abraham chosen?’ is to emphasize how it might quiet the fault-finders and the naysayers: as Nehama Leibowitz writes, “The evil part of man, the evil-mindedness of fault-finders both from Israel and the nations demands to know why Abraham served to be chosen of God. Wherein lay his merits, his devotion and self-sacrifice? R. Yose b. Zimra regarded the story of his sacrifice of Isaac as the Torah’s answer to that question.” According to this line of thinking, the binding of Isaac was indeed a test of Abraham, conducted for the purpose of establishing his worthiness in the eyes of others. In other words, Abraham is tested so that his detractors would be silenced. And you can see a similar logic applied in some of the theological responses to natural catastrophes like hurricanes: Perhaps God intended to test us to demonstrate something. Perhaps God intended to show us or someone else some kind of lesson. Perhaps God was bestowing some kind of badge of honor in the form of our suffering. Or something. But that is still not a very satisfying answer, is it? In other words, the command to sacrifice Isaac was a test of motives: the test was to determine whether Abraham would respond out of reverence for God rather than out of a fear of punishment. And Abraham clearly passed that test. But if this logic is applied to the case of the hurricane, then what would that kind of theology look like? We might conclude that perhaps this event allows us to demonstrate our finer qualities, and it provides an opportunity to learn something about ourselves in the process. But of course, such concepts create objections: but why must it be necessary to suffer first? What makes the test necessary in the first place? And why must the tests be so difficult, so wrenching, so hurtful? Would it not seem that God is unduly malicious in distributing these tests? In other words, we are back to our original question: why? Why is it that some people have all of the contents of their lives swept away in a tidal current, while others maybe a few miles away still have power and phone service and all of their stuff? Can we claim that one family was wicked and the other virtuous, and that’s why they had very different outcomes? Let’s pull that apart and look at it for a moment. First: We cannot conclude that the family that lost everything must have been wicked, for we know too many counter-examples to believe that is the case. We all know really good people who have suffered greatly. Not only that, but also: if only wicked people experienced catastrophe or got sick or lost everything we would not think it necessary to extend help, visit the sick, or donate to such causes. But we know better. We know that awful things can strike wonderful people. Or even mediocre people. So, what can we say about the other option? If we were to conclude that the family who lost everything must be virtuous, than perhaps this loss was a test of their faith, or a test of their mettle, or a sign of their great strength, or a test to teach them or others that they have the power to overcome such obstacles. But that theology breaks down too: then why should it be necessary at all? Why the suffering? What if those who were tested in this manner would rather that this test be passed to someone else, thank you very much? What if the catastrophe is not considered to be a desirable route to sainthood, but merely the catalyst in the creation of an interminable list of decisions regarding which things are to be salvaged and which are to be scrapped? And what if the person tested buckles under the weight of it, or is proven to be only marginally virtuous? There is also, of course, the naturalistic option: we could explain such events as the natural unfolding of world events. There is no need to ascribe such things to God; we can simply point to factors such as global warming and changes in weather patterns. We might perhaps take it as a warning that we should take seriously the threat of rising seas. These responses are indeed rational. But we are back to the problem of God again: where was God in all of this? What purpose does it serve to have a belief in God, if that God is impotent in the face of disaster? It is this kind of thinking, in fact, that drives people to conclude that there is no point to worship, and no value in religion. So let me reframe this discussion, in the hope that we might find a more fruitful way to proceed. First, I think that we must necessarily assume that there is chaos inherent in the structure of the world. This is both a theological and scientific statement: when we look at the substructure of the world around us, we find a surprising amount of flux. This kind of uncertainty is what allows for new, creative growth: something new and surprising and novel may at any time arise because the world is not rigidly deterministic. Not every outcome is predetermined; in fact, most are not. There is chaos in the system. That chaos is also a source of disarray, of disease and of disgust. When a child gets cancer, it is that same chaos at work. The wondrous process of cells dividing and recreating themselves goes awry and creates outcomes not at all desirable, and potentially deadly. So there is chaos in the system. How should we then proceed? Does this mean that God is not in charge? It means that God is not controlling the small details of your life, at least not on the micro scale. You are the one who decided the way you came to this place; it is not God then deciding that you must arrive safely – though I wish it were possible that such things could be assured: for example, I would like to draw a protective circle around my son to keep all possible harm distant from him. It just doesn’t work that way. We have no guarantees. So why should we invoke God at all? Why not adopt a view like that of Spinoza, who argued that God was nature in the process of being nature – nothing more, and nothing less? There may indeed be chaos in the system and all sorts of unforeseen outcomes, but that is not the same thing as saying that it is all totally random. That is not the same thing as saying that it has no meaning. That is not the same thing as saying that there is no concern ‘out there’ for you both as an individual and as one of many human beings. Rather: there is something inherent, deep within us and yet all around us that is vibrantly real, unseen but powerful, a different kind of energy than the ones we can normally detect with our senses. It is that energy that convinced the ancients that God was an overflow of goodness or intellect. It is that energy that causes the little hairs on the back of your neck to stand up when you know, somehow, that you’re not alone in a situation that just a moment ago felt so lonely. It is that energy that somehow is present in a real way in key moments, unspoken and mysterious, but very much there. It is that energy that surges when you do what is right, as if it were to take delight in that very thing, as if there was nothing more important in the whole dazzling universe as that small moment in time, when the sunlight dances on the leaves and you think to yourself: yes, this, all of it, is good. Yet that energy somehow also transcends time and place and feeling, running deeper than mere emotion. It is that energy that announces the very presence of God. So, yes, we should be rational and investigate precisely how our western lifestyle has contributed to climate change. We should indeed be open to the possibility that this storm has its causes, some of which may be attributed to human activity. We should use our intellects to create methods of coping with these events and methods of preventing the damage and strategies for rebuilding. But we should also be open to the possibility that we can encounter God, even in the daily mundane world, even in the extremes of catastrophe on a grand scale. Stand still for a moment and listen: God is not in the fire, or the earthquake, or in the hurricane, but in the still small voice, in the quiet murmuring. Listen. You are currently viewing the archives for November, 2012 at Godtalk.